Every political party has its decades-long policy idols, held up as shining examples of ideological purity and logical consistency but which, somehow, never seem to see the light of day in the real world or among serious people. On the left, total nuclear disarmament falls into this category: the loony left has wanted it since long before the vast majority of them were born. Powerful leftist leaders like President Obama himself swear fealty to the idea - and yet, somehow, we all realize that there's no way even Mr. Obama would actually decommission our Very Last Nuke. As an idea and theoretical goal, it has great power; as a practical policy, not so much. There is a similar issue on the right, and that issue is truly fundamental tax reform. This is not to say that our tax system doesn't need some help; anyone who actually attempts to read the tax code will need the services of a forklift. Examining and overhauling the countless insanities, set-asides, sneaky loopholes, and public-policy biases baked into our tax system is well worth the effort, and over the years there have been several useful and helpful tax reforms. Much as a ship collects barnacles and needs a good scraping-down from time to time, so does the IRS. Many conservatives want something more profound than mere heavy maintenance; they call for a complete teardown and rebuild in the form of the Fair Tax. The idea of the Fair Tax is transparently simple: get rid of the income tax and have a national sales tax instead. The scheme is not without a certain appeal. Not only is it a serious pain in the neck for individuals to report their income to the government, it's a serious privacy problem. Why, exactly, should you have to tell the government how much money you make, and from whom? It's none of their business, really, and having the government know who's got money leads to all manner of tyrannies large and small. At a White House conference earlier this year on the government's budget problems, a roomful of tax experts pleaded with Treasury Secretary Timothy F. Geithner to consider a VAT... "There is a growing awareness of the need for fundamental tax reform," Sen. Kent Conrad (D-N.D.) said in an interview. "I think a VAT and a high-end income tax have got to be on the table." A VAT is a tax on the transfer of goods and services that ultimately is borne by the consumer. In economic terms, a VAT is exactly the same as a sales tax, except that unlike the sales taxes we're used to, it's paid by everyone who handles products as they are manufactured. VAT stands for Value-Added Tax, which means that each processor pays tax on the difference between what they paid for their materials and what they sold them for. The VAT is probably the ideal tax from a conservative point of view. As a broad-based tax on consumption it creates less economic distortion per dollar of revenue than any other tax--certainly much less than the income tax. If Republicans are successful in defeating a VAT, the alternative will inevitably be significantly higher income taxes, which will do far more damage to the economy than a VAT raising the same revenue. Here's the problem: the virtue of the VAT, thus explained, is precisely its fatal flaw. A national sales tax, whether it be in the form of a VAT or anything else, is indeed good at hoovering up revenues for the government; it is extremely difficult to evade, and does screw up many fewer activities than the income tax. It's painful only in the pocketbook, not in April 14th migraines and IRS-letter-induced heart attacks. That's why it's bad - in fact, that's why broad-based taxes of any kind are bad. That's exactly why lovers of big government so badly want one. John Anderson tells us that first we've got to reduce spending before we can reduce taxes. Well, if you've got a kid that's extravagant, you can lecture him all you want to about his extravagance. Or you can cut his allowance and achieve the same end much quicker. Following this philosophy, Reagan cut taxes and funded his military spending by deficit borrowing; Bush did the same. Bill Clinton, on the other hand, helped by a Republican Congress, cut spending enough to actually reach break-even for the first time in years. The Republican view was that raising taxes is politically painful and cutting them is politically profitable; so, cut taxes, and trust in Democratic opposition to deficits to force them onto your side when it comes to spending cuts. There's only one fallacy with this plan: it makes the assumption that Democrats genuinely dislike deficits, and that getting rid of them is their top priority. As what is fast becoming our favorite graph clearly demonstrates, though, this is totally wrong: Democrats only attack deficits when they're being generated by Republicans. 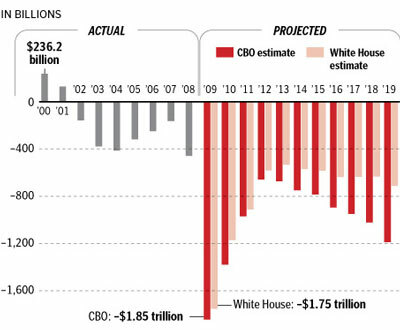 With President Obama on the throne, he is merrily running up more debt than all our past presidents from George Washington to George W Bush put together. Not only is there nary a squeal, the Democrats are competing to see who can spend the most money. Democrats want nothing more than to spend money: they don't care where it comes from, as long as they are the ones that get to spend it. No, Mr. Obama's Democrats are following the same underlying idea as Reagan and Bush, but in reverse: instead of starving the beast to make it shrink, they are shooting it full of borrowed steroids in hopes of making it big enough to consume the entire economy before Republicans can recover and stop it. Thus far, their plan is working excellently; there is every indication that the Chinese are growing tired of loaning us infinite amounts of money in our own easily-debased currency. When they stop, the money to fund the Obama deficit will have to be found somewhere - and that somewhere is your wallet. Like most systemic problems of governance, this one was anticipated by our Founders, who designed safeguards into the Constitution. In particular, the federal government was explicitly forbidden to directly tax anything or anybody already within the country, except on a per-head basis. So a head-tax of, say, $10 per person, payable by the states, would be legal; but taxing the revenues of people, companies, or even the states themselves would be unconstitutional because not directly related to hard population numbers. As a result, for the first century and a half, the federal government got most of its revenues from import tariffs which the Constitution permitted. This was intentional; the Founders wanted to make imports more costly, as an encouragement to domestic industry in what was, at the time, an almost totally rural, undeveloped country. As the nation grew and industries developed, however, import percentages became less and less, and the federal government found that it couldn't readily lay hands on as much money as it wanted. The call went out for a new source of funds, and the Progressives - today, we'd call them Liberals - answered in 1913 with the 16th Amendment to the Constitution, granting Congress income-taxing power it had not had before. The 16th Amendment didn't set the level of income tax - it's gone up and down. It didn't specify the rules, either; tax brackets have changed many times, as have all manner of exemptions. What the amendment accomplished was to permit the federal government to reach its hand into a pot of money totally prohibited to it previously. Before the amendment, Congress could legally take not one dime from income taxes; after the amendment passed, the government was permitted to collect whatever amount the political process could get away with. Now that is a profound change, and it led to the profound changes we've seen in our country since then. Today, the federal government is involved in areas the Congress of 1912 would have never felt to be its job. Why? Because it can. Yet even with access to all our incomes, our government is not satisfied. That's because every year, in April, the taxpayers can see the monstrous amount of money they are shelling out, listed at the bottom of our 1040 forms. Because the money is mostly withheld by our employers, we don't see it and feel it all through they year; it's no accident that Tax Day is almost as far from Election Day as it's possible to get. But it's still there, and we do still see and feel it. Not so with a sales tax, and particularly not with a VAT. With a sales tax, at least you have the momentary irritation at having to shell out $1.10 for a putatively 99-cent burger. But the amounts involved tend not to be too large. Even the sales tax on an expensive purchase, like furniture, is going to be a small fraction of your total sales tax bill for the year - though we can't help but notice how many people like to go on annual shopping trips to low-tax states, and how the great and good tried to avoid outlandish New York sales-tax bills on their fine art and jewelry. Nevertheless, 99% of the time a sales tax will bag you without you even noticing. That makes it easy for the government to crank up the rates - first starting small to get people used to the idea, then slowly notching them up over time. Americans are used to price inflation; everything is more expensive today than ten years ago. Who but economists will know how much is due to the higher taxes? People won't know why the economy seems sluggish, and their kids are struggling even to be as well off as their parents were at that age - in fact, this problem is already being noted. The American Dream will die by degrees, choked to death, while people wonder why and we turn into a sclerotic European welfare state. Taxes are, at best, a necessary evil. A small tax is better than a high tax; a visible one is better than an invisible one, because the visible tax can more readily be kept from growing. The worst possible case is a high, mostly invisible tax. That's exactly what a national sales tax is, whether FAIR, Flat, or VAT - and that's exactly why a president who believes government is the answer to every problem wants one. Almost certainly, we wouldn't abolish the income tax: we'd wind up paying both, which is exactly what has happened everywhere else the VAT has been tried. No doubt the conservatives pushing for the FAIR tax have the very best of intentions - but we all know that's what the road to hell is paved with. Any new tax of any kind is, rather, a road that should be stood athwart yelling STOP. Once a new, previously nonexistent tax is inaugurated, it takes more than a mere act of Congress to get rid of it, but an actual act of God, Who has quite a few other urgent and pressing matters to occupy Him at the moment. Save Him the trouble of divine intervention; let's put the kibosh on this bad idea before it gets out of the idea stage. How can you possibly say that the income tax is more obvious than sales tax? That's absurd on it's face. Most Americans don't see any tax obligation on their 1040; they see a refund. All year long, tax money magically disappears from their paycheck without them lifting a finger or sending anyone a check. I know more than a few people who look forward to tax prepration because they know that they always get a refund. Sales tax is in your face with every purchase you make. When the state increases it even half a percent, you hear the bellyaching border to border. A few years back, the state of Virginia increased sales tax from 4.5% to 5%. The state was in desperate need of road fixes, and the governor said this will fill the hole. The debate was SO hot, that the increase wasn't pushed through until the NEXT guy came into office. Any child knows, from the moment he's old enough to belly up to the store counter, the sting of sales tax added on to his candy bar. He goes in thinking his 50 cents will work, and finds out that some magic hand in the sky wants 3 or 5 or 10 cents more. The obviousness of sales tax is only one of many tenets that make the Fair Tax the right option. Another important tenet is that it is - wait for it - FAIR. It applies equally to businessmen and drug dealers alike. Everyone buys stuff so everyone gets taxed. There are HUGE holes in the current process because it is so easy for cash-based businesses to cheat the system. Another tenet is its simplicity. You've used that against itself as some sort of weakness, but I can't figure out why. The fact that it's simple to administrate does not equate to it being more simple to "con the citizen with". In fact, if anything it's the exact opposite. Right now, the COMPLEXITY of the tax code makes it easy for Rangle & Co. to play games. They extract money from those they don't like while giving more to those they do. Credits and deductions allow them to reward the people and agendas they approve of. A tax system that is simple to understand - from both sides - is a tax system that gives power back to the people. The Fair Tax movement leads, firstly, with the charge to REMOVE income tax. It is frustrating to think that a VAT might be added in addition to income tax, but that is not the fault or cause of anyone who supports the Fair Tax. That is the consequence of an increasingly-socialist political system that no longer understands the value of capitalism. Turning against the Fair Tax movement to stop the tide of added government taxation is basically throwing in the towel and saying "Fine, We give up. At least, just keep the income tax system as it is without adding anything else." Do you really expect that to work? Conservatives needs to FIGHT the current tax system, not negogiate to keep it in place for fear of something worse. If you can get the 16th Amendment repealed, then establishing the FAIR tax would be worthy of sober consideration. Unfortunately, as you say, I can't help but pretty much throw in the towel regarding conservatively helpful constitutional amendments - and that's without reckoning with the possibility of an activist Supreme Court simply disregarding them, as is entirely possible. I imagine if there were no 16th Amendment, the modern Supreme Court would not rule an income tax unconstitutional even though it patently would be; they didn't seem to mind Obama's takeover of GM and Chrysler even though Congress expressly voted down a bill to give him that power. The FairTax has written into it suspension of income taxation and the IRS for a sufficient time to repeal the 16th Amendment (which requires a different procedure). If that doesn't occur in the time alloted the FairTax goes away. The evil inherent in giving Congress the power to tax income without restraint other than public opinion has allowed them to gradually develop a tax code through which they are an entity that rules us rather than represents us. Our forefathers predicted that the assumption of this power by Congress would lead to their corruption and the end of our Republic. It is a power a government must have to become a Socialist State with all property belonging to the State. I second that a sales tax is perhaps the most visible tax there is. In addition, it is generally championed by economists as one of the least growth hampering taxes. I do not see the sales tax as being very visible, but far worse than its visibility is its regressive nature. Poor people should not pay a higher percentage of their income than high income individuals. You can argue flat tax, but regressive, it simply doesn't make any sense. Sales taxes are always regressive. The poorer a person is the higher percentage of their income they spend. The more the government ends up having to help them so that they can make ends meet. Income tax is highly visible to me. I look at my pay stub every two weeks and die a little inside. It is correct that many people look at April 14 as a refund, it allows them the opportunity to know exactly how much the federal government is costing them every year. Maybe they take advantage of it maybe they don't but at least they can. On the other hand, a sales tax you never really notice. Few people take the time to look at how much tax they pay on any given transaction and no one that I have ever met adds all those numbers up through out the year to see just how much they are losing. In my opinion, if there really is a need for anything other than taxes on imports, a modified flat tax would be the best idea. The first 50,000 (give or take) of your income is tax free anything earned after that is taxed x%. You can earn the money you need to live tax free, anything above that is taxed at a flat rate so as to not punish the incredibly successful. No deductions, no loop holes, every penny that goes into your bank account gets taxed. That to me seems to make sense. Sales tax isn't regressive. You're basing that off of the assumption that poor and rich people buy the same things. What's the sales tax cost on a yacht or airplane? What's the sales tax on filet mignon instead of ground round? Rich people would pay more because rich people BUY more. The important thing is to adjust our perspective on what tax is for and what it punishes. Taxes punish growth. Between labor and consumption, it is FAR better that consumption be punished. You want people earning as much as they can as often as they can, unfettered. I'd be willing to back a flat tax, but the bottom, non-taxed tier would have to be a lot less than 50k. That's a lot of money; there are places in the country where you can live on a lot less. To me, the bottom, non-taxed tier would have to be 10-15k which would mean you *really are* poor. That's minimum wage money. If you make minimum wage, fine, you don't pay taxes; everyone else does. Otherwise, you'd be incentivizing staying under 50k since that's easily enough to live on. @lfon: Sales taxes are indeed regressive because poor people spend a larger percentage of their income than rich people. If everyone pays 10 cents for every dollar they spend then a person who spends 100% of their income will pay 10% taxes. A person who spends 50% of their income will pay 5%. You are correct that we do not want to punish earning money, however we do not want to punish spending money either. A tiered tax system can become punishing if the slope is too steep, but as taxes are written today in America it is never in one's financial interest to earn more money. You may decide that the marginal profit becomes too small to be worth the effort to go beyond X dollars but at no point do you earn less one dollar below Y dollars than you do one dollar above. @Ben: Fifty thousand, as noted by the give or take, is by no means a well researched number. However I do not want it to only be the very poor that are not taxed at all. I see that cut off as a way to allow people to move up to a relatively comfortable level without taxes inhibiting their ability to improve their lives. I've seen research that shows beyond 35kish dollars (I learned about it in college... six years ago, so the numbers may have changed) a year people do not become happier with their lives. So perhaps that should be the number where we place the line. Question: If a rich guy buys a Gulfstream V, how much of his income has he just spent? Answer: More than his ENTIRE income. One of the powers of being rich is the power to leverage other people's money. The rich can borrow vastly more money than the poor and they do so every day to invest, build businesses, and buy toys. Those purchases - whether fully owned or borrowed for - would still be taxed. What's the flat sales tax on a $35 million jet? He pays that UP FRONT on the sales price while paying off the loan for the next 20 years. If anything, the rich would pay MORE of their income than the poor. It's common to mistake the rich as having chests of gold, but only spending some fraction of it on food and shelter. That isn't reality though. They use those chests of gold to borrow against bigger purchases still. A "regressive" rate is a rate that adjusts downward as the thing its weighed against increases in volume. For sales tax to really be regressive, it would have to have tiered rates for the person making the purchase. A poor man walks into a candy store and pays for a $1 soda. The clerk asks the man for his latest paystub or bank account statement. Upon review, he says "Ok, you're poor so your sales tax is only going to be 5%. Give me another 5 cents." A rich man walks into the same candy store and goes through the same process. Upon review of HIS statements, the clerk says "You're rich. The sales tax is 50% for you. I need another 50 cents." Nor do I accept the premise that the poor paying a larger percentage of than income than the rich is wrong. The poor are going to pay a larger percentage of their income than the rich on EVERYTHING they do. Consider food and shelter. Most poor people are live "hand to mouth" which means they spend everything they make on the essentials just so that they can eat and sleep. Is it unfair then that they are paying a larger percentage of what they earn on groceries than the rich? According to your definition, that would mean super markets are charging regressive rates for groceries. Should food prices be tiered so that the rich pay more for bread and milk? You start to see the absurdity. ALL prices for ALL products are then unfair to the poor because they are spending a larger percentage of their income on them. So a head tax would be regressive, every person pays $100 regardless of income. The more you earn the smaller the percentage of your income you pay. Attempting to get tax revenue out of the lower half of Americans is like whipping a dead horse, they simply don't have much to give. As you stated many people, especially at the bottom, live pay check to pay check, in other words their entire income is used simply to continue to live. The more money a person earns the more likely they are to save money. With a sales tax saved money is not taxed. So in any given year much of the money earned by the upper class is not taxed. You might argue that they are going to take that money out eventually and spend it. However that isn't really the case. If they are prudent they will be able to retire and live entirely off of the interest of their earnings and thereby never have to pay any taxes on the principle. Then given a reasonable death tax, they would be able to pass that on to their children or perhaps donate it to a charity. In this way even over a life time the richer person will pay a smaller percentage of their income in taxes, providing rock solid 'loop holes' to protect their money. You mentioned debt as a way to increase purchase power. It is indeed true that the rich are able to receive more money in loans than poor people, since they are much more able to pay them back. However, I would guess (although I do not know for certain) that poor people spend a much larger percentage of their income via credit cards and small loans than rich people do. And a sales tax would have the effect of taxing those loans, even more strongly adversely effecting the poor. Right now, in America the lower 50% pay a tiny fraction of the revenue of the Federal government. I have to believe that the effort that the government expends in processing so many tiny payment, and ensuring that people are paying their taxes is barely worth the money they spend to collect it. Remove the "FAIR" and "National Sales" from the title, and I'd agree with you. The FAIR tax is not the same as the VAT tax. They are very different creatures. The FAIR tax is good for the precise reasons the VAT tax is not. My understanding of the fair tax is that all the embedded taxes on all products are gone and the 1000$ TV will be a lower price at retail. If you buy that tv, the 1000$ TV will be less but with the 23% tax, the TV will be 1000$. The thing about the fair tax is that if you gross 1000$ you bring home 1000$. You choose to save it or spend it. Every month there is a prebate check sent back to you for taxes paid on the essentials, food etc. based on the poverty level. So if a really poor person wants a 1000$ TV, it will still be $1000.00, but they will have their entire minimum wage check to pay for it. All people that don't currently pay taxes, will pay if they buy products. I really don't see how this is a bad thing for anyone except politicians, thieves, and illegal immigrants. It would bring untold jobs, corporate HQs and prosperity to the US. Don't want to pay tax, don't buy anything. You will still get your prebate check for the essentials.